Apply to check the single cable flaming test for FT1, FT2/FH/Horizontal flame, FV-2/VW-1, FV-1/Vertical flame, and standard arcing test. 2.Bunsen burner: Which according to ASTM D5025-2005 standard, Inside diameter of the burner tube is 9.5mm by length is 100mm, the Gas spout diameter is 0.9mm by thickness is 1.6mm. Which burn gas is methane at 98% minimum purity, the inner flame height is 40±2mm, the outer flame height is 125±10mm, nominal rate is 500W with a flame ruler which can check the flame height whether it meet requirement at any time. 3. 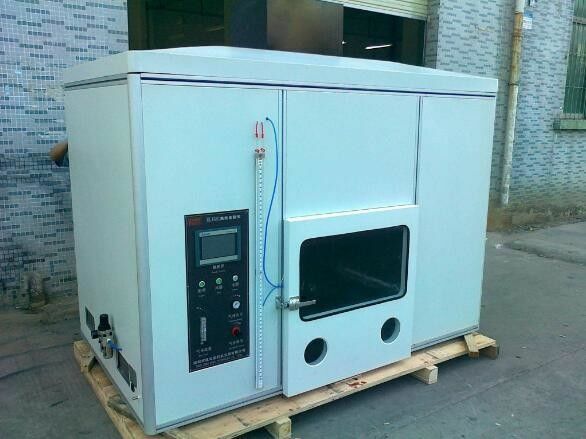 Temperature measurement system: According to ASTM D5207-2003 standard, including 10g temperature measurement copper pieces, Type K stainless steel thermal which diameter is 0.5mm,stopwatch and thermometer. 4. Specimen stands: Horizontal and vertical stands both independent, which made by Stainless steel. 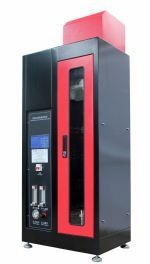 The vertical stand could do the vertical burning test & FT1 test, cables flaming test, VW-1 flaming test and horizontal specimen/FT2 flaming test. 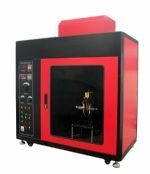 The horizontal stand only for electric cable horizontal specimen flaming test. 5. Gas: Methane which at 98% minimum purity, or nature gas which with a heat content of 37.1MJ/m3 or 8.9 kilo calories /m3. The cotton diameter is150~200mm & thickness is 6mm, which is to cover an area of testing surface W 305mm by D355mmon the vertical axis of the specimen, the cotton with a strip of unreinforced 60-lb or 98 g/ m2 Kraft paper which wide is 10mm and length is stick on the sample, then leave over 20mm from the specimen toward the rear of the draft-free chamber. 6. 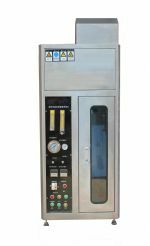 Flux system: Which consist of decompress valve, flow-meter which flux range is 1000ml/min, pressure gauge which pressure range is 200kPa, green oil which density is 1000kg/m3, and U shape pressure meter which range is 36”. 7. 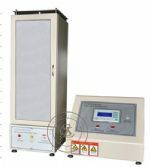 Timing system: Which consist of flaming timer, stop-burning timer and extending-fire timer etc. total 3 timer devices.